Fall is in full swing here in Oregon and that means several things. First of all, it means there will be rain/fog/cold misty-grossness until June. Second, it means SWEATER WEATHER. And last of all, but probably my favorite, it means that comfort food weather is upon us! Don’t get me wrong, salads and grilled meats are delicious. I enjoy lots of fruits and vegetables in the summertime, but something about the warm and hearty comfort foods of fall…they speak to me. I love nothing more than a big bowl of soup with crusty, fresh bread or something creamy and cheesy and….mmmmm….where was I again? But folks, I’m not getting any younger, and my metabolism is not getting any faster. And if you recall the last 3 months I have been sharing about my journey with type 2 diabetes, so I have to keep my blood sugar under control. That means reeeeally watching my carb intake. I have been able to bring my A1c (that’s your blood sugar average over 3 months) to ALMOST non-diabetic levels. I try not to load up on breads and pastas, but as we all know, their siren song makes it VERY hard to resist, especially when the weather starts to take on a chill. We just want to crawl up in a blanket and eat all the carbs. So instead of loading up on junk and hibernating this winter, I’m trying to embrace The New Comfort Food! This is a dish I make OFTEN. It’s deceptively simple. Fast and easy enough to make on a weeknight, but grand enough to serve to guests. It’s also yummy enough that your kids will eat it (you can always leave out the mushrooms and capers or add them on after you serve the kids). 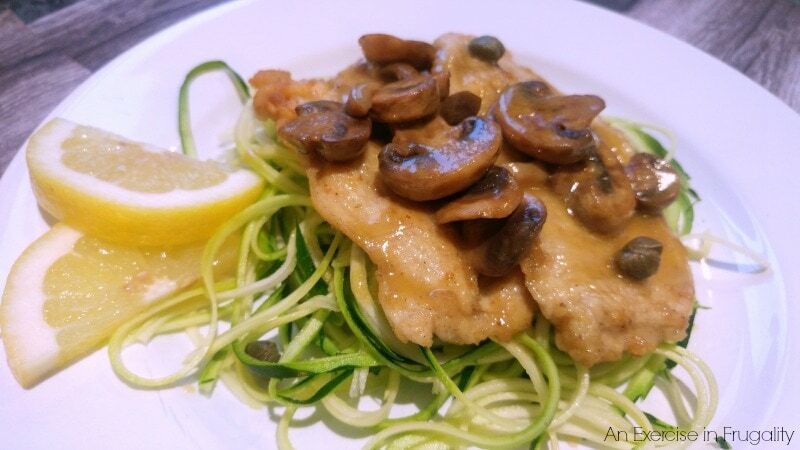 Even if you’re not diabetic, we all run the risk of over-indulging and putting on the pounds with too much sugar/starches so implementing easy swaps like zoodles can help. They are DELISH and so easy to make. 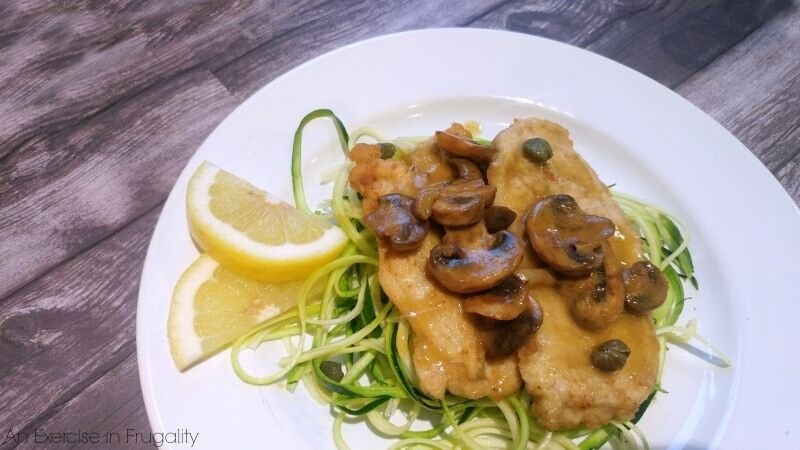 Another reason I love this chicken scallopini is because while its comfort food, it’s loaded with fresh vegetables! If they are in season, I highly recommend getting fresh, local ingredients for this dish because it truly takes it up to a whole other level. I like to get fresh, organic mushrooms and locally grown zucchini. I will also get a local white wine sometimes if I am feeling particularly fancy (here in the Pacific Northwest we have a LOT of local wineries to choose from!) and I like to use Foster Farms chicken. 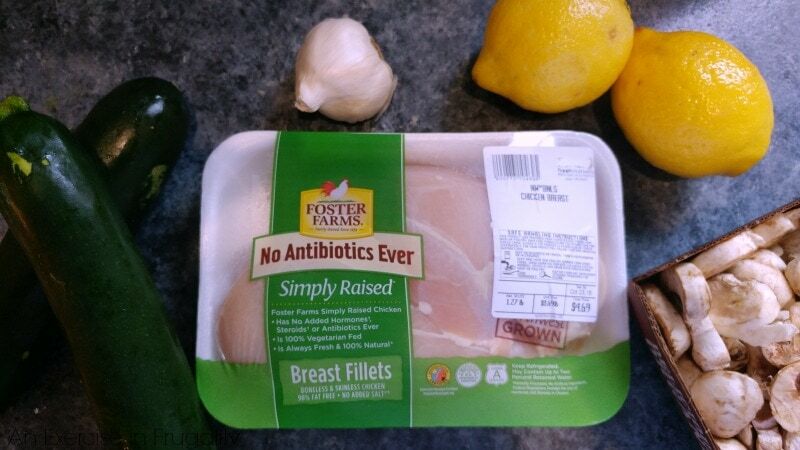 The Foster Farms Simply Raised chicken is antibiotic free, locally raised in the PNW (and California) and is always fresh and delicious! It truly is The New Comfort Food! In a small bowl, combine tapioca flour, salt, pepper and poultry seasoning. Slice chicken horizontally into thin cutlets and pound until about 1/4 inch thickness. Dredge each piece of chicken in the tapioca flour mixture. Pan fry each piece of chicken until cooked through (a couple minutes per side) and lay on paper towel. When all the chicken is cooked, add the white wine, chicken stock and lemon juice to the pan and scrap up all the cooked bits of chicken. Bring sauce to a boil, then reduce heat to simmer and add mushrooms and capers. Cook 5-10 minutes until mushrooms are tender. 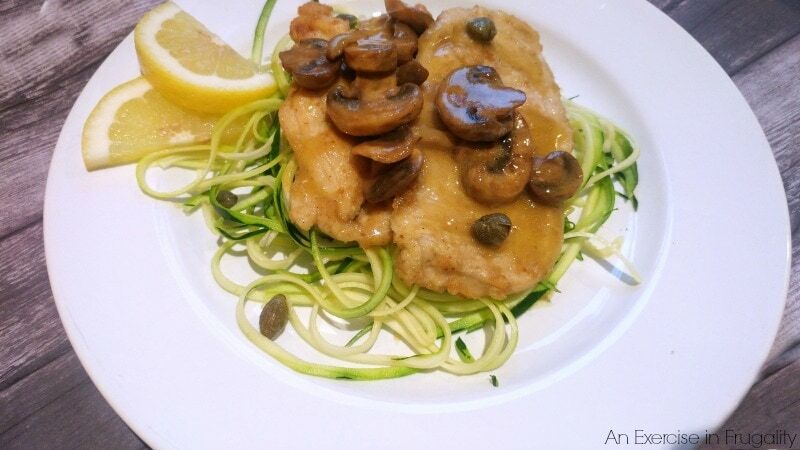 Serve chicken on a bed of zoodles (spiralized zucchini) and top with the sauce and mushrooms. I would love to hear how you like it! I make this so often I don’t even follow the recipe anymore, I just eyeball it and it comes out great every time. We eat this pretty often and enjoy it every time! It’s a very forgiving recipe that can be tweaked to your liking. If you aren’t a fan of zoodles, this is just as delicious with fresh steamed broccoli or cauliflower mash. 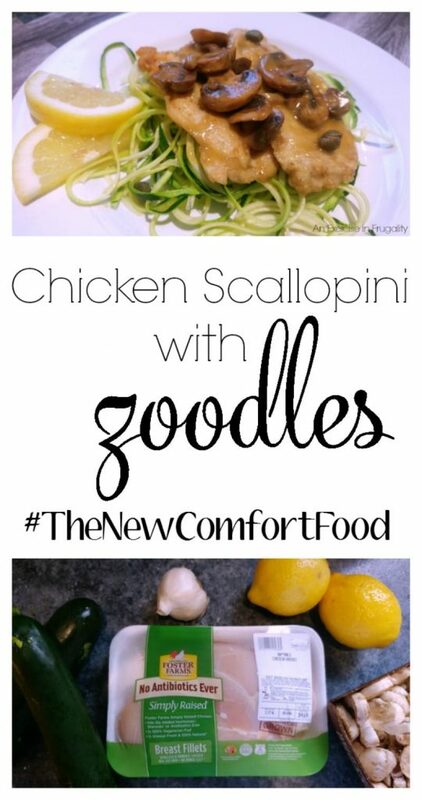 You can saute your zoodles but I prefer them raw so that they don’t get mushy. The sauce and chicken will warm them right up! Visit the Foster Farms website to learn more about the Simply Raised fresh chicken, and use it in your new comfort food recipes!